... Like other Italian musicians of the time, Bottesini also wrote a number of sacred works, the most significant of which is his Requiem, the form of the Catholic Mass which had recently inspired masterworks from Mozart, Berlioz, Cherubini, Cimarosa and Verdi. While over the centuries there had been many settings of the Requiem, or Mass for the Dead, in the Romantic era the genre moved away from its liturgical roots somewhat to reflect instead the symphonic and operatic trends of the day, resulting in versions written on a grand scale for large forces. 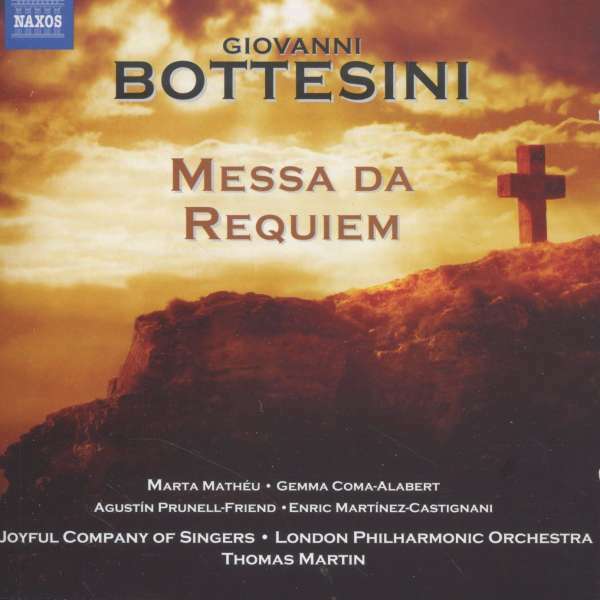 Bottesini's Requiem was composed in early 1877 in response to the death of his brother Luigi. It was first performed in the Capuchin chapel in Cairo, Bottesini then being musical director of the city's Italian opera company. A large audience thronged to hear it and gave the performance a warm reception. It also earned an enthusiastic review from the correspondent of the Gazzetta Musicale di Milano. The first complete performance took place at Turin's Teatro Regio on 2 th March 1880, but was not well attended - not only was it Holy Week, but the theatre was not known for staging sacred works. One year later, however, the requiem won a silver medal at the National Music Expo in Milan. Recorded at Henry Wood Hall, London, UK, from 15th to 16th February, 2012.